Deb's Cup of Tea: Works like a dream. 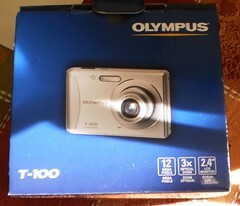 Remember me mentioning I dropped my old digital camera? Thanks to Niles and newegg.com, this arrived in the mail on Tuesday afternoon before I left. I opened it up, looked it over and, there's no memory card. Um... Plus, the software enclosed is for Windoze. Double um... Oh well, I have a regular camera that shoots good old fashioned print photos. I have 4 rolls of film to use up. I'll just use that until I can get to Carole's and they can help me buy whatever card I need. Carole and David snickered at my camera. They use Nikons exclusively and consider those the best cameras. My former camera was a Nikon. It was a good camera. But this was on sale and there were no Nikons in the same price range. I asked about the memory card. "You can get a 4 gig card for $20," he says. "So how many photos does that hold?" I ask. "Oh around 3,000," he replies. Now, if I was a serious photographer, that might be a good thing to get. But, I use my digital camera to document my life, my cats' antics, snow and rain, my friends and family, in short, not the serious kind of photography that Carole and David do. I do enter photos in the Farktography contests, you'll find them under "Gimmlette", but I shoot what I like. Three THOUSAND photos is way too many. David actually had a small card he wasn't using that holds 300 photos. That's more than enough for me. Possibly, had I had use of the camera on the way to Connecticut, I would have used up the 300 photos, but, as it was, I shot 271 and a few of those, now that I've uploaded them to my computer, are destined to be deleted. This is a great camera for me. The downloading cable from my Nikon works with this camera. It takes a bit longer for the photos to upload but it's very easy to do. It fits in my purse and is palm-size. I kept it on the dashboard of the Jeep on the way home. When I get the photos from the trip up on Flickr, I'll provide a link. I like the quality and the camera is fast, in bright light as well as low light. It was easy to learn to use, too. So, that was a good way to start the trip, with a camera that turns out to be a good fit for me. I'll be taking more photos now. I may need to stick some from my iPhoto libraries onto CDs to make room on my hard drive.